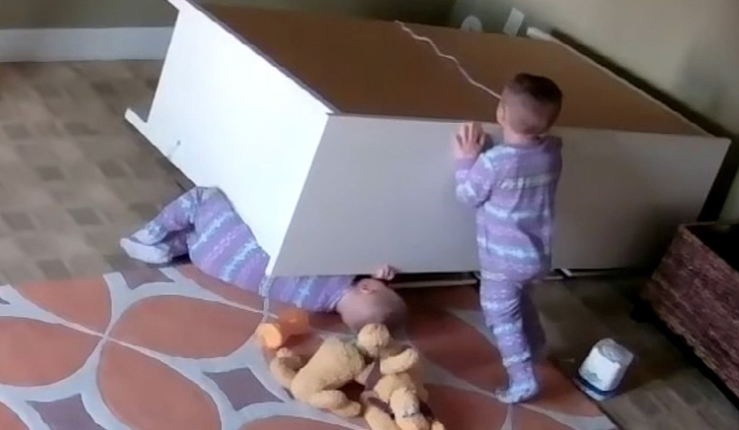 It was brotherly love in action in one Utah home after a toddler came to the rescue of his twin brother who was trapped under a dresser after it toppled over onto him. There’s no question Shoff and her husband have their hands full with their two and half-year-old sons, Bodie and Brock. To help keep an eye on them, they set up a video camera in the boys’ room. 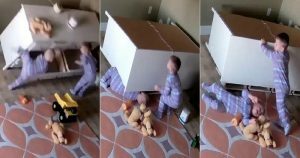 The twins’ parents were cautious about releasing this nanny camera video but felt it may help other families be aware if they have large dressers in their young children’s rooms. A home surveillance video shows Bowdy trying for almost 2 minutes to free his brother from under the furniture eventually succeeding. “I usually hear everything but we didn’t hear a cry. We didn’t hear a big thud, so we just, we woke up, looked at the camera, we’re like ‘What’s going on? Are they still sleeping?’ Then we saw that it was all the way down they were just still playing. So we didn’t know if it had landed on them,” said twin mother Shoff. The video showed Brock and Bowdy in matching pajamas climbing into the dresser’s drawers. Because of their combined weight, the furniture tipped over, trapping Brock underneath. Bowdy, who managed to wiggle out, seemed to very quickly realize what he needed to do. He tried to lift the dresser, but it was too heavy. Placing his two hands against the top of the dresser, his right foot forward, Bowdy pushed as hard as he could, sliding the furniture off his brother. Do share your views about the incident in the comment session below.